This is subtitled Freedom City, Book 2, and it does start soon after the last events of Freedom City. Familiarity with the events in Book 1 will definitely help, but Manifest Destiny stands well on its own. Freedom City is an artificial city but a real country above international waters in the Caribbean Sea, about a hundred years in the future. Taking as a model the 20th-century “pirate” offshore radio stations located on abandoned marine platforms, Freedom City was constructed by those fleeing the confiscatory socialistic laws of the United States. Freedom City declared its independence and operates under libertarian principles. Its freedom to allow the development and application of scientific and technological research, as opposed to the increasingly restrictive Public Safety laws of other countries, has made Freedom City a technological and industrial leader, but a social pariah among other nations; particularly the United States which even denies that Freedom City is a nation. “Manifest Destiny; Freedom City, Book 2”, by Phil Geusz. FurPlanet Productions, June 2012, trade paperback $19.95 (294 pages; on Amazon). The protagonist of both books is Harvey Foote, the owner-manager of The Rabbit’s Foot, the biggest and most successful hotel-casino complex on Freedom City. This makes Harvey the richest businessman on Freedom City, which, given its extreme libertarian lack of government, makes him the unofficial political leader of the country. 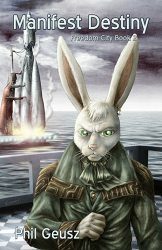 Harvey has had himself gengineered into an anthropomorphic rabbit, the living symbol of his business empire, and he requires his employees to become rabbit-people, too. (This has set up an argument in fandom as to whether Harvey is being reasonably libertarian – it’s his company and money, so it’s his right to set his rules of employment – or unreasonably tyrannical – his is for practical purposes the only company in town, so what if someone needs a job there but really does not want to be made over into a rabbit-person?) In Freedom City, Harvey and his wife were the targets of assassination by powerful enemies, which they barely survived. Worse, under America’s orders, practically all the other industrialized nations are opposed to Freedom City’s space program, and they sabotage it by encouraging subcontractors within their borders to break their contracts, by setting up prohibitively high tariffs against Freedom City’s exports, and by domestic propaganda to discourage their own peoples from going to Freedom City as a tourist haven. The Freedomites support their space program and Harvey’s right to contribute his own money toward it, but many of their business leaders are being crippled by foreign nations’ refusal to do business with them as long as they support Harvey. Harvey and his friends talk proudly about sticking it out, but he is privately afraid that if Freedom City does not cave in, the other nations led by America are prepared to escalate to a shooting war – one that the armyless, tiny artificial-island nation is sure to lose. In Manifest Destiny, Harvey goes about his business of managing The Rabbit’s Foot – even though he is officially retired, he cannot help returning to micromanage, and his “advice” is always so commonsensical that his new managers and staff take it; running Freedom City’s Conestoga space program and, as the official Foreign Minister of Freedom City, stalling off U.S. Ambassador Sirius Asraith’s, and other international protests; and looking in on his scientist wife’s secret research at the Foote Institute into really revolutionary new technology, like teleportation/matter transmission. Freedom City is displayed as mostly freedom-loving humans; a lot of anthropomorphic rabbit-men and –women who work at The Rabbit’s Foot; a few cat-men and –women, left over from a failed rival hotel-casino; and one or two oddballs such as the man who has had himself genengineered into a talking but otherwise unanthropomorphic donkey. As America’s hostility becomes ever more obvious – the U.S. government starts refusing Freedomites, who are mostly from America, visas to enter the country, and American newspapers justify using the Freedomites’ obvious genengineering technology to create anthropomorphic animal-people to editorialize about their “blatant bioweapons ability”, more and more Freedomites rush to enlist in their country’s militia. Harvey is proud of their commitment to Freedom City, even while he recognizes that even if the entire population is willing to fight off an American invasion, the U.S. Marine Corps alone could easily conquer the artificial island-city, never mind the rest of the American military. Then the U.S. invades, with Spetznaz assassination teams in addition to regular military forces; a group of Freedom City Quislings tries to replace the elected government (such as it is); Freedom City’s ultra-top-secret project comes under attack; and there are over 120 pages still to go! This may be Phil Geusz’s most dramatic novel yet. (It is also one of his oldest; a previous electronic edition was published in November 2003.) It is also, while totally original, reminiscent in some aspects of Ayn Rand’s Atlas Shrugged. Both are paeans to libertarianism, and where Rand’s enigmatic John Galt makes a thirty-page speech to explain his libertarian philosophy, Harvey Foote makes a six-page speech to explain his. Despite this, Manifest Destiny is even more riveting reading than Freedom City is. Do not miss it! "No God or Men, only Furs."